A durable, purpose made cover to protect your ride-on. Ideal for keeping your tractor safe from the elements, this high quality cover has dimensions of 250 cm length, 125 cm width and 130 cm height. The colour may vary between black and silver, while it is not suitable for models with a front-mounted cutter deck. To Fit: Small to medium sized ride-ons. Not suitable for models with front mounted cutter decks. This sturdy compact tractor is a perfect mower for anyone looking for a discharge or mulching machine. It ha a large 108 cm cutting width that makes it ideal for lawns up to 2.5 acres. An 84 cm cutting width garden tractor suitable for lawns up to 2 acres, Stiga's Estate 3084 H is a high specification machine packed full of premium features. This 92 cm cutting width lawn tractor can tackle gardens up to two acres, powered by a Briggs & Stratton engine and benefiting from hydrostatic transmission included as standard. 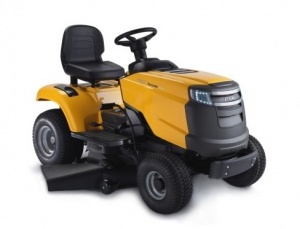 A premium-quality 92 cm / 36 inch cut lawn tractor, this machine is perfect for gardens up to 2 acres. It is also a pleasure to use, with excellent features included as standard. With extreme versatility and sturdiness, the Stiga Tornado 7118 HWS lawn tractor lets you manage a wide range of tasks on different kinds of gardens and terrains. With a 121 cm deck. This lawn tractor is the right choice for intensive and demanding works in large gardens, even with high lawn and tough terrain conditions. With a 121 cm cutter deck.